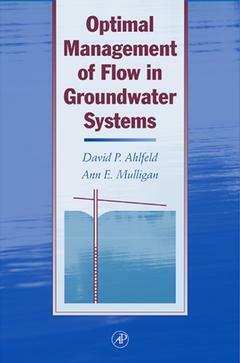 Optimal Management of Flow in Groundwater Systems Ahlfeld David P., Mulligan Ann E.
Authors: Ahlfeld David P., Mulligan Ann E.
Add to cart the livre of Ahlfeld David P., Mulligan Ann E.
tools to aid in the management of groundwater. Drawn from the operations research literature, this book combines methods for optimization techniques to numerical models for the simulation of groundwater flow. The resulting management model provides a valuable tool for optimizing performance of groundwater systems. This volume will fill a significant gap in the technical literature on groundwater modeling and management. Preface. List of Variables. Groundwater Flow Management. Groundwater Simulation. Building the Management Formulation. Solving the Management Formulation. Using the Management Model. Advanced Linear Formulations. Formulations with Binary Variables. Formulations with Nonlinear Functions. Appendix. References. Index. Technical professionals, students, and researchers involved in groundwater modeling and water resource analysis. Specific professionals include civil engineers, environmental engineers, hydrologists, and hydrogeologists.